Poland wanted to believe it could defeat Germany, even though the intelligence they were being supplied with suggested something very different, believes WWII historian Professor Richard Overy. RT: Professor Richard Overy, we are here at the Imperial War Museum to mark the 70th anniversary of Hitler’s invasion of Poland. Let’s talk first about the events leading up to that. 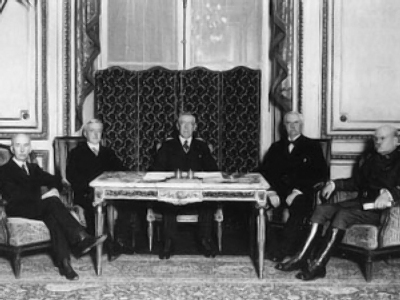 How did the terms of the Treaty of Versailles lead to the outbreak of the Second World War? Richard Overy: It’s very easy, I think, to argue that the Versailles settlement basically caused the Second World War. But it happened 20 years before, and a lot of other things had to happen in between. I think we are really looking for the causes of the war. It lies in the revival of German nationalism in 1930s and the extraordinary consequences for Europe of the economic crisis. RT: So why did it happen in essence? What are the reasons that you enumerate? R.O. : The war with Poland is something Hitler wanted. He wanted a small war in the late 1930s. He wanted the blood. He wanted to give his armed forces a chance to show what they could do. He wanted to show to the Western parts that they cannot tell Germany what to do anymore. I think one element of this which we often forget is that before that, Mussolini had his small war in Ethiopia, and the Japanese had their war in Asia. I think Hitler felt that he was missing out, that he wanted a small war as well. RT: In late August 1931 the Germans and the Soviets signed a pact. What effect did that have on the outbreak of the Second World War? R.O. : Well a pact is very important because for Hitler, of course, the assumption was the pact with the Soviet Union would make it clear to the British and French that there was no chance of an alliance with Russia and they might as well give up, as there is nothing they can do about Poland. And it made him more convinced that he could attack Poland without the British and French becoming involved. But, of course, the treaty for the British and French it didn’t make any difference to their position. They distrusted Stalin, they undervalued the Red Army and they convinced themselves that Poland was an ally. So, in some ways, the pact made the war more certain. 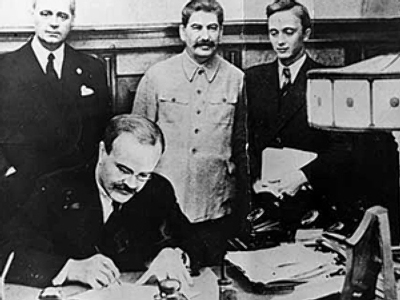 The person who really gained from the German pact was Stalin because he avoided wars he didn’t want. He was able to approve Soviet security permission in Eastern Europe to seize more territory to get access to German technology. And he thought that if the capitalist parties fought between themselves they would fight a war exhausting what they had done in the First World War. And at the end of that there would be revolution in Western Europe, and the whole of Europe would become communist. RT: Attempts would be made throughout the 1930s to appease Hitler, which is the policy that Churchill at that time vehemently opposed. If Churchill’s policy had been followed, how do you think things would’ve been different? R.O. : No, I think we exaggerate the extent to which Churchill would’ve confronted Hitler and would’ve stopped the Second World War. I think we also exaggerate the extent to which the British and the French appeased. Of course they didn’t want to declare a war with Hitler in the middle of the 1930s, but then there was no real need to. I think that the problem Hitler found was that when he wanted the British and French to be accommodating over Poland, for example, they weren’t. They decided to declare a war. In this case two things were clearly important. The Poles and the Polish army were absolutely convinced that they could stand up to Hitler, to the Germans. In this they were, of course, deluded. And the other factor is that German armed forces when they reformed themselves in the 1930s were absolutely at the cutting edge of the technology or battle tactics, and so on. This was a completely unmatched contest between Germany and Poland. And what the commanders in chief thought didn’t really matter, what mattered was how effective these armed forces were on the ground. RT: How did Poland so badly underestimate Germany? R.O. : I think the problem was that the Poles had never really seen the Germans in action in the 1930s because, although the Japanese troops and the Italian troops were fighting Germans, they hadn’t fought in the 1930s. And they thought all the other states were being tricked by Hitler that actually the German realm was a bit of a sham. And when it came to the test, the Poles were brave. They fought with determination to save their independence and so on. So they even assumed that they might even be able to push their way onto German soil even perhaps to attack Berlin. And I think the problem was that they wanted to believe it, even if the intelligence they were being supplied with might’ve suggested something very different. RT: How expected was that invasion? R.O. : Well, Allied, British and French intelligence had already worked out the German plan. They had all kinds of intelligence details fed though to them. They knew almost exactly that the invasion was going to take place. So they had no illusion about Hitler’s intension to invade Poland. What they hoped they could do was deter Hitler by being firm. They thought Hitler would just back down, even though he had all those plans. RT: Following Hitler’s invasion of Poland, was there ever any doubt that Britain would enter the war? R.O. : For a long time I think the historians have argued that Chamberlain deserted in the early days of September and that he would’ve liked to extract Britain from the obligation to Poland, like in the Munich crisis giving up on the Czechs and so on. But only archive evidence makes it absolutely clear that Chamberlain was determined to honour the obligations he had to Poland. But he still hoped and hoped and hoped that Hitler would see sense and recognize that Britain and France were serious and that he would withdraw his forces. RT: For a period of nine months following the declaration of war Britain didn’t fight – why was that? R.O. : There was no fighting at first. Partly because the British and the French had drawn up a war plan before the outbreak of the war in which they reckoned they could do the same thing as during the First World War: to fight a war of attrition, of economic blockade, eventually they would bomb Germany too – that was also part of the plan. And they expected the war to last for three years and they would stand in the West to see what the Germans would do. What they hoped to do was to bottle Germany up until the German public was fed up and would overthrow Hitler. That was the policy they used in 1918. So, the British and the French, in a curious way, were fighting the last war, while the Germans were fighting the next war. RT: And why didn’t that policy work? R.O. : Well, the policy didn’t work because Hitler wanted to advance the war to the British Isles, he wanted to invade France quickly with a one-hand blow, the Germans thought that was possible and they had the experience of fighting an integrated war, but Hitler took the gamble – he invaded in May and France was defeated in six weeks. RT: On May 10, 1940, Churchill replaced Chamberlain and the so-called “Lightning War” began. What was that? R.O. : People have often called the German tactic the Lightning War or “Blitzkrieg”. The Germans never really called it that. They developed the idea in the 1930s that, when you attack, you use tanks and aircraft in support of the ground army and you use your tanks and aircraft as a kind of punch, iron fist, to push your way through the enemy lines. Then the old-fashioned infantry would come in and you'll be fighting the same kind of war. And the British and French had really failed to anticipate Germany's capacity to do just this. And because France was defeated very quickly, Poland was defeated very quickly, Denmark, Norway and so on, the idea of Lightning War, a war which would be over in a flash, became popular and we have used the term ever since. RT: Sometimes Britain has underestimated the role of Russia in repelling Hitler. Why do you think that is? R.O. : Well, there's always been a tendency to assume that British and American bombing and D-Day is what really won the war. And for a long time there was very little information about the Russian war effort in the battle with Germany on the eastern front. With the fall of the Communist bloc in the early 1990s, a lot of new research was possible. I think a lot of Russians still wanted to try and put Russia on the map, and suddenly it would be discovered that Russia had borne the brunt of the German assault in the Second World War. Russia had inflicted more casualties on the Germans than anybody else, and had inflicted, in the end, the decisive blow on the German army. RT: How did that got unnoticed for such a long time? R.O. : Well, people – I mean historians – knew about it, of course, but I think it was of no interest to the public, because the Soviet Union was an enemy, the Cold War enemy. Nobody wanted to pretend that the Cold War enemy had somehow defeated their old enemy Hitler. So it became a function of the Cold War. And when the Cold War ended, it became possible to do a much more candid assessment of Russia’s role during the Second World War.